Probably the most colorful vaudeville show- Berlin invites you to the stage. You always wanted to dance Burlesque or Show Dance and gain confidence? 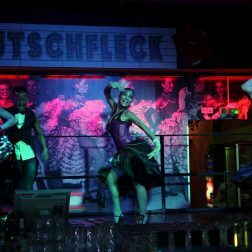 Knutschfleck Berlin offers a course for every woman, regardless of age, appearance, or previous knowledge, a 3-hour beginners course in the current popular style of all dances. 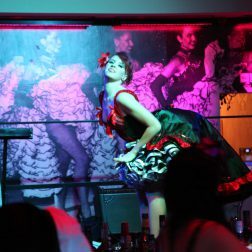 With us, every woman who wants to learn new moves, sniff Moulin Rouge-air and feel seductive and well, is welcome! And also all others such as bachelorette parties, office parties, birthdays and other groups are always very welcome! The 3-hour workshop is a beginners course, the level of which varies according to the group. It involves learning a Burlesque and/or show dance choreography to perform. In addition, a brief introduction is given to the subject of Burlesque. Our professionals share tips and tricks for the right showmakeup and the seductive outfits of the dancers. Whoever wants, is allowed to bring her own accessories and perform on stage. The most important part of the workshop: Just have fun and celebrate the result on stage with a glass of sparkling wine at the end! This seductive and unbelievably athletic dance style is fun for all and the ideal training for a dream figure! Enjoy yourself! In a large group booking there may be discounts. This is particularly worthwhile for a bachelorette party, a birthday party or for a group team building event! Sign up for for a Burlesque Workshop !